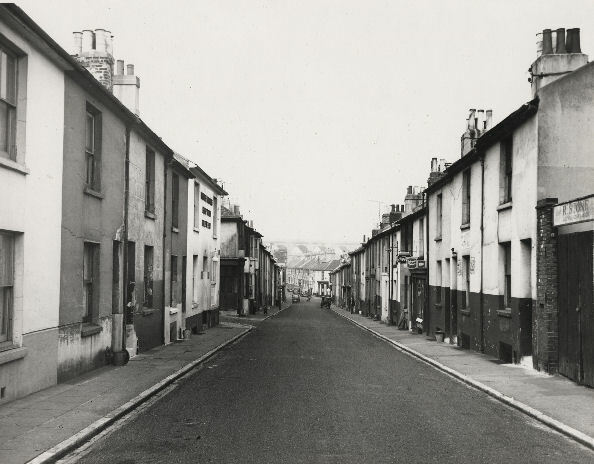 This section of New England Street was acquired by the Council as part of the 1956 Compulsory Purchase Order. Many of these buildings were demolished in the 1960s. New England Street itself was lengthened in order to replace New York Street, and make the link to south Cheapside. I am looking for information about a family in New England Street in the 1940s and 1950s. Does anyone know of a Cecil Walder Leonard and his wife Florence? They had about four or five children, and one son was called Stanley. Cecil was born in South Africa. I am looking for any information on the Cox family in New England Street in the 1920/30s. Can anyone help? Hi I was born in New England Street in March 1947, I do not know which number. Does anyone remember the Laker family ( George/Alexina/Georgina (Zena) and Dorreen)? My grandparents lived here in the 50s until they were rehoused. They were an Irish family called Heading. He was Billy and she was Maisie, they had two sons called Danny and Freddy. I’m not sure which number but, it was on the opposite side near Fyffes bananas. I think Freddy worked there as a driver, he also bred Alsation dogs. Billy was also a driver. They lived mostly in the basement where the kitchen was, always had the light on. When they moved one of the dogs called Di came all the way back from Manor Farm and I was taken out of school to fetch her, as no one dare go near her. I left her in my house on Campbell Road, my dad got a shock when he came home from work. I also had a friend Joyce Chapman who lived a couple of doors away, we went to St. Bartholomew’s school. Did anyone know the Lace family or Tom Eade, landlord of the Fitters Arms? Cecil and Florence were my grandparents. I didn’t know them, but I do have a small amount of knowledge about them. I’m researching family history so would be glad to swap any info. Cecil Walder Leonard of New England Street and Florence were my Father and Mother-in-law. My wife was their daughter Sybil. I may be able to assist in some way. Further to my last remark on the Leonards I will suffice to say, that Florence was a loving mother but completely dominated by her husband. They had seven children, one died in the London Blitz, the rest left home as soon as possible. Cecil Walder was not a great father and that is putting it mildly. I also remember being able to enter the station railway sheds from New England Street up a flight of steep steps. I worked there when part of it was given over to the production of a little three wheeled car which was called the Isetta. My brother and I were born in New England St – Glyn and Melvyn Thomas. Glyn in 1952and Melvyn in 1951, both November and Robert Lenoard Thomas. We left in about 1955 for South Wales as my grandfather was dying. We moved to a little village called Croeserw and in the village were prefabricated houses and there was a gang of workers knocking them down. They were the same people that demolished New England St – what a coincidence. And every time England play Wales in any sport I always support England. Does anyone remember the Greens, William and Charlotte, who would have lived in new England Street in the early 1900s and could have lived there until the 1950s? William Green worked for the railway and they had several children. I lived in New England Street and knew the Greens. We lived at No. 10 and I think the Greens lived near us on the other side of the road. My mum had triplets when we lived there.